Ethyl acetate has long been associated with wine spoilage, imparting a distinct nail polish remover aroma to affected wine. Although a common taint, it has not traditionally been a very common test in our labs. One reason for this may be due to misconceptions about how it is measured in the lab and the misapprehension that it can be estimated from more common tests such as volatile acidity or acetic acid – which it can’t! Recently however, there has been a surge in requests for this analysis across our five labs and it has prompted us to take a closer look at this compound. This article provides some background to ethyl acetate formation in wine, including factors that can lead to increased concentration. It will also clarify how it is analysed in the lab (or more importantly, how it is not analysed!) and examine the correlation between ethyl acetate and acetic acid formation in wine. Ethyl acetate is the most common ester produced in wine. In simplified terms, an ester is an organic aroma-producing compound formed by a reaction between an acid and an alcohol. In grapes and wine, they are most commonly produced by yeasts during fermentation, creating by-products that react with ethanol to form esters. Some of these esters are used within the yeast cell for other processes; some are produced in excess and excreted into the wine. 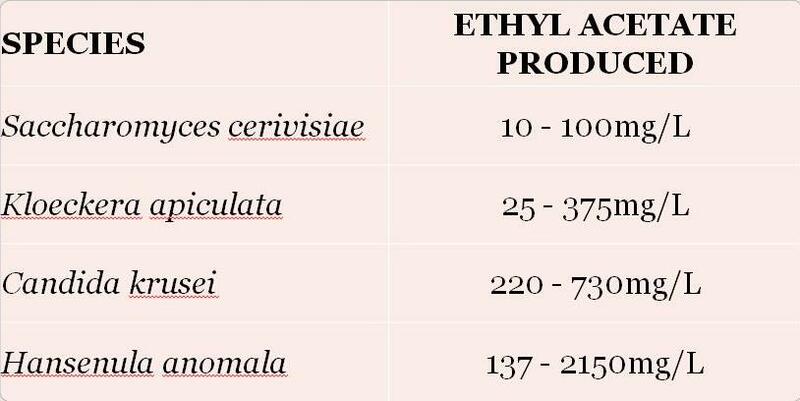 Ethyl acetate can also be produced by acetic acid bacteria, reportedly under low oxygen conditions (1) and also by very slow esterification of ethanol and acetic acid over time. Some species of yeasts have a propensity to produce more ethyl acetate than others (see Table 1). ‘Native’ or ‘spoilage’ yeasts are known to produce higher levels than Saccharomyces species, so it makes sense that the prevalence of these yeasts can lead to increased levels of ethyl acetate in the finished wine. Any environmental factors that increase the speed of fermentation will decrease the rate of ester production. High fermentation temperatures generally speed up a ferment, so cooler temperatures can result in higher ester production and retention – one source reported that maximum formation of ethyl acetate occurred over the temperature range of 10 to 21 degrees Celsius (2). In addition to these main factors, other factors such as the level of nitrogen present, the concentration of sulfur dioxide and the activity of acetic acid bacteria can also affect the amount of ethyl acetate produced. The presence of ethyl acetate is not all bad. At low levels it imparts a fruity character to wine and a positive contribution to wine aroma. The aroma threshold in wine is around 12-14mg/L (4) and levels up to around 60mg/L are considered to have a positive effect on the wine. The concentration at which ethyl acetate is described as imparting a spoilage character to the wine is subjective and depends on variety, wine style and a drinker’s sensitivity to the ester. A general consensus is that levels above 150mg/L are problematic. The average concentration across all wines tested in our labs over the last 5 years is 127 mg/L. Around 25% of all wines had a concentration of less than 60 mg/L. 34% of all wines tested had a concentration greater than 150 mg/L and a handful of wines reached concentrations in excess of 600 mg/L. A recent analysis of around 50 wines of the same variety, same vintage and made in Victorian regions showed a range of ethyl acetate concentrations from just above 50 mg/L up to 170 mg/L (see Figure 1). 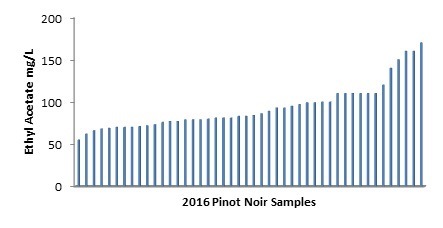 Figure 1: Survey of ethyl acetate concentration in 2016 Pinot Noir samples. Ethyl acetate is the ester of acetic acid and many of the factors contributing to high levels of ethyl acetate also contribute to production of acetic acid. Generally speaking, high levels of acetic acid correlate with high levels of ethyl acetate present in a wine. This is not always the case and factors such as yeast strain and fermentation conditions can lead to high levels of ethyl acetate with corresponding low levels of acetic acid. For this reason, it is not always wise to rely on analysis of acetic acid alone as an indicator of wine spoilage. Figure 2 shows the correlation between wines tested in our lab for both ethyl acetate and acetic acid. As you can see, a positive correlation exists, however it’s a relatively weak linear relationship. Although measurements of high and low ethyl acetate were observed under all different winemaking approaches, it was generally observed within this data set that wines containing high ethyl acetate and low acetic acid had longer pre-ferment macerations, longer fermentation duration and were made without the addition of a commercial yeast. Figure 2: Correlation between concentration of ethyl acetate and acetic acid in 2016 pinot noir samples. 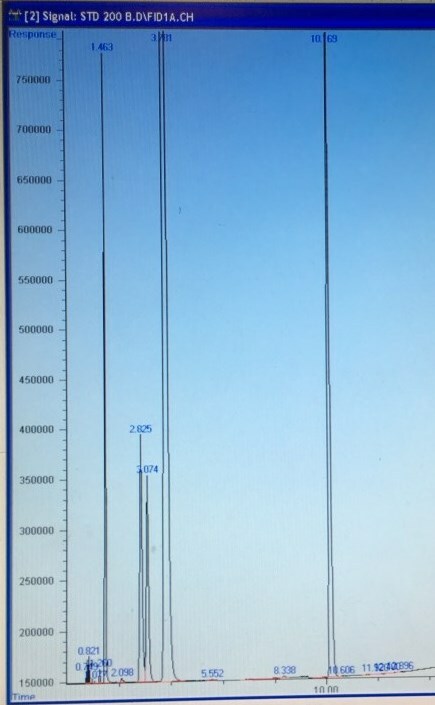 Ethyl acetate is analysed in our lab by Gas Chromatography (see figure 3). It cannot be analysed by the steam distillation determination of Volatile Acidity (VA). Put simply, the Volatile Acidity test by definition measures acids – and ethyl acetate is not an acid! Volatile Acidity (VA) is a measure of all volatile acids in wine. These acids can include: acetic acid (the main volatile acid in wine), lactic acid, formic acid, butyric acid, propionic acid, sorbic acid, carbonic acid and sulfurous acid. Acetic acid is the main volatile acid in wine and is included in the analysis of VA by steam distillation. It is also analysed by more specific methods, most commonly enzymatic analysis. Ethyl acetate is not a volatile acid and therefore not determined by steam distillation or specific methods determining acetic acid. Its presence in wine can enhance the perception of volatile acidity, however that is a sensory effect and is not related to a particular analytical determination. 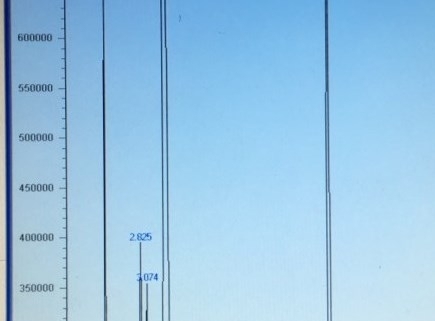 Figure 3: Typical chromatograph trace showing elution of ethyl acetate at approximately 2.8 minutes. Ethyl acetate has long been known to impact on wine quality in both a positive and negative way. Concentrations can vary from levels below sensory threshold up to spoilage levels greater than 150 mg/L. Yeast strain, fermentation conditions and bacterial activity are some of the main factors affecting concentration. Although high acetic acid content and the presence of ethyl acetate are generally associated with each other, the two compounds are not always produced in a set ratio. Importantly, acetic acid can be determined by VA analysis, ethyl acetate cannot. Analysis of ethyl acetate by GC has become more popular recently, with winemakers using this result as a tool to better gauge spoilage levels in their wine, rather than analysis of VA or acetic acid alone. Fugelsang, K.C; Wine Microbiology, Chapman & Hall, 1996, p.56. Zoecklein, BW. Fugelsang, KC. Gump, BH. Nury, FS; Wine Analysis and Production, Aspen Publishers, Inc., New York 1995, p. 196. Fleet, G; Wine Microbiology and Biotechnology, CRC Press, 1993 p.39. Margalit, Y; Concepts in Wine Chemistry, The Wine Appreciation Guild, South San Francisco, CA, 2004, p. 29.